This is an amazing product. Possibly one of the best Special Edition Blu-rays that I have ever had the experience to watch and review. This is lovingly put out by Flicker Alley. 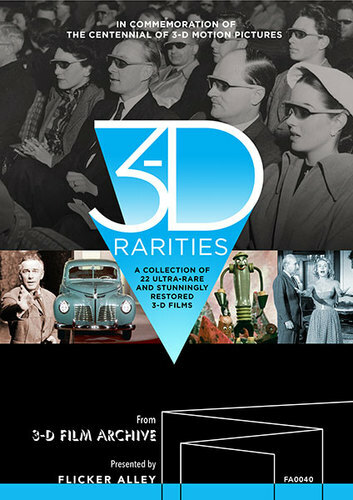 This is jam packed with 3-D features and amazing Extras. A great mix of films that give a wonderful experience. These films finely see the light of day and are given special treatment that they deserve. These forgotten pieces of filmed history is pure entertainment. Highly recommended. A must see Blu-ray. A high class product. The audio and video is what really stuck out with this one. Everything could be heard with crystal clear clarity. First off, these where old negatives in the first place. The restoration that has been done is utterly and extremely crafted in video and audio. I saw no fault. The video was crisp and clear and was very vibrant in colors. Everything could be viewed as crisp, and neat on screen. 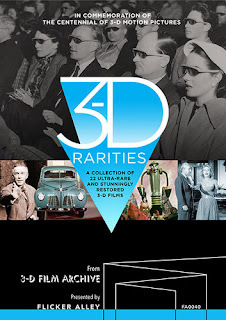 This Blu-ray experience has a vast array of artists and icons throughout, such as, Richard Carlson, Nat "King" Cole, Rocky Marciano and a whole bunch of others, that should be seen, to be appreciated. This also is filled with a beautiful array of composers such as the greats like George Steiner, Trustin Howard, Paul Dunlap, Clarence Wheeler, Winston Sharples, Billy Ward and his Dominoes. The films range in age from 1922 -1962. I cannot fathom the degree and pain staking work that must have went into remastering, and cleaning these old films into beautiful vibrant pieces of important and historical moments of cinema history. It has a running time of 147 minutes. This was the best 147 minutes I have experienced in a long time. Flicker Alley released a rarity in the world of constant Blu-rays, for in my viewpoint this is a must own, and must see experience for anyone who considers themselves a cinema lover. This amazing release can be enjoyed both ways. 3-D and also 2D. A wonderful product, by a wonderful company.